We feel very fortunate to be part of a swim team were parents are very involved in making the team a successful entity. There is an active group of people that work on communication, fundraising, meets' logistics, etc. It is a great community where you see parents and swimmers cheering and caring for each other. As part of the team, we volunteered this season to take pictures of the swimmers during meets and offered parents the opportunity to purchase prints of their kids swimming in order to raise money for the team. We are very thankful and happy to see how the team appreciate our work and the end results. With this project we got to know a great group of parents and swimmers a little bit more. This was a very nice experience for us. Since sport photography is not part of our everyday business, having the opportunity to do this project taught us a lot. When it came to taking the pictures, there were some challenges we found on the way, The first one was the quality of light at the pools. All of them have very poor light conditions for photography. It's not only difficult to get a good bright picture in low light without using flashes. It's also difficult for the camera to focus fast on the swimmer. Specially when the swimmer only gets his head of the water for a fraction of a second. And in freestyle, some swimmers only breath once or twice on a pool length and it may not be necessarily on the direction of the camera. Another challenge is to try to capture all the kids in the swim team. 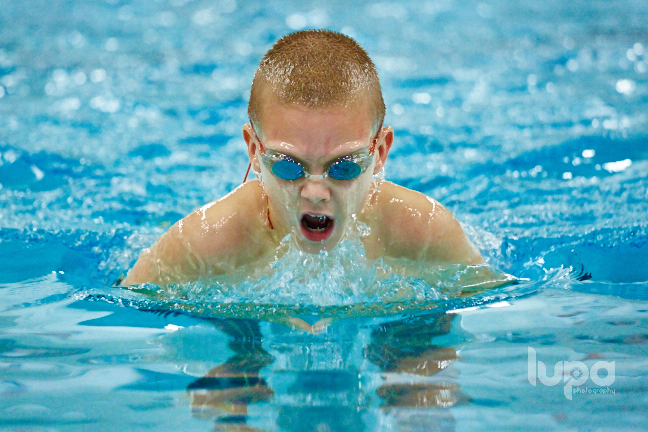 It's difficult to identify some of the kids when they are wearing goggles and a swim cap. Events run fast and sometimes there were three or more swimmers from the team swimming at the same time. The swimmer bellow is CJ. one of the swimmers of the team. It has been great to see him grow and improve his stroke and times through out the last two seasons.